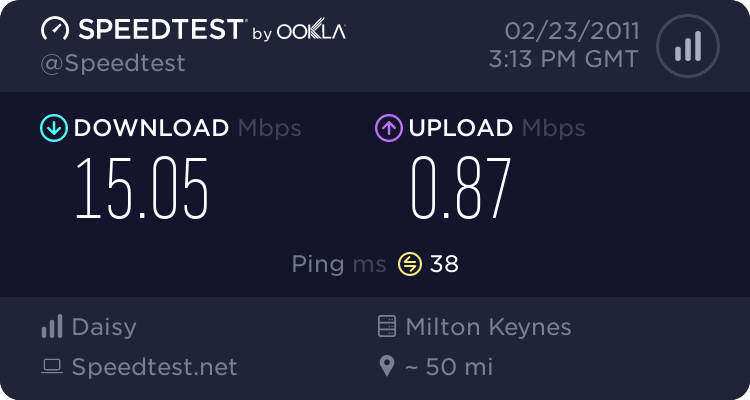 I have recently set up my BT broadband and I am worried about the speeds I am recieving. I was sold the package as "BT was the fastest on the market". I got the home hub set up on Friday 22nd and I tested the speeds yesterday. There are two lines into theproperty on which uses talk talk and my one which uses BT. Its not the line. That was a new line Installed by BT the same week. Its not the distance from the exchange as the Talk Talk set up is in the same house. Could it be the line not settled down yet? The line hasent dropped and seems to be steady. Could it be BTs line contention? The service is used for work to connect to a VPN and is too slow to work effectively as it stands. Can I leave BT and go with another ISP if they cant match the sort of speeds Talk Talk are getting? The lines may take different routes to the exchange and have a different number of joints. Could you post the router stats for each line? As john2007 has posted the only possible helpful reply, I would just point out that the quote you give, "fastest on the market", is simply untrue. As is the other statement BT often make, that they provide "the fastest speed your line can support". Without seeing the router stats to compare, I'm going to take a wild guess and say it's because Talk Talk is ADSL2+(upto24mb) and BT only has the 10 year old ADSL(upto8mb) equipement. Have to see what the routers say to confirm my theory.